Hundreds of Tibetan students have taken to the streets to demonstrate support for protestors who are demanding greater freedoms under Chinese rule. The protesters argued they are “shouting for the freedom of Tibet and also for the return of his holiness, the Dalai Lama, back to his homeland" and “that Tibetans will continue despite China’s efforts to suppress and intimidate them”. Hundreds of students have taken to the streets in eastern Tibet to demonstrate support for protestors who are demanding greater freedoms under Chinese rule. The protest Friday in the town of Rongwo in Rebkong, eastern Tibet - called Quighai Province in Chinese - was in reaction to the death Thursday of 18-year-old Kalsang Jinpa who died after setting himself on fire. Witnesses said the former monk raised a white banner calling for the Dalai Lama’s return to Tibet. They also said the protest drew a large crowd and the situation there remains tense. Word of the new protests came as China opened its 18th Party Congress in Beijing for a once-in-a-decade leadership transition. Rebkong has now seen five self-immolation protests since March, including Wednesday's fatal protest by 23-year-old single mother Tamding Tso. Tibetan exiles also confirmed Thursday that another man set himself on fire a day earlier in Driru, in Nagchu Prefecture in the Tibet Autonomous Region. On Wednesday [november 7th, 2012], three teenage monks from the Ngoshul Monastery in Goman Township set themselves afire. One of them died on the scene. The new self-immolations bring the total number to at least 69 since February of 2009. In 54 cases, the protesters have died. In Dharamsala, India Thursday exiled Tibetans gathered to pay homage to the protesters during a special prayer service. One of them, Lamsa, expressed hope the fiery protests would resonate with the rest of the world. He also said it was no coincidence the protests took place just as China embarked on its leadership transition. "This is because there is no freedom in Tibet and they are shouting for the freedom of Tibet and also for the return of his holiness, the Dalai Lama, back to his homeland," he said. 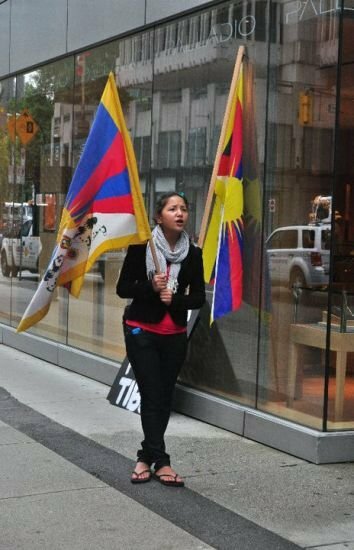 London-based Free Tibet Director Stephanie Brigden agreed, saying the protests were clearly aimed "at sending the next generation of China’s unelected regime a clear signal that Tibetans will continue to fight for their freedom despite China’s efforts to suppress and intimidate them." U.S.-based Human Rights Watch cautions against drawing any conclusions about the timing of the latest protests, though HRW China Director Sophie Richardson calls the latest wave distressing. "Until we see the Chinese government take steps toward meaningfully and seriously dealing with the kinds of grievances people in the region are articulating, we're going to see more of these," she said. Richardson also says there are no indications Chinese leadership will take any public notice of the self-immolations during the much-watched Party Congress. "I'm skeptical there will be any public or discernable discussion about Tibet or immolations except, perhaps, as vague references in the context of broader discussions about security and the quest for a more harmonious society," she added. But Richardson says it is likely Chinese officials are talking about Tibet behind the scenes, especially given the way Tibetans are responding to the self-immolations. Funerals and cremation ceremonies for self-immolators have been drawing larger and larger crowds, sometimes numbering the thousands. Often, there is little notice such memorials are about to take place, suggesting Tibetans are managing to spread the word about the protests despite the ongoing Chinese crackdown on sharing information. "That has to have caught their [Chinese security officials'] attention," Richardson explained. "Whether they have any intention of responding to those in a rational way that is geared towards understanding and responding to the grievances really remains to be seen. But I think until that happens we are going to get more of this heart-breaking news." On Wednesday, Tibet's government-in-exile pleaded with China to change its approach to the issue of Tibet. Parliament Speaker Pempa Tsering says it may be the only way to stop the deadly protests. He also lamented that many Tibetans feel they have no choice but to burn themselves alive to make their cries heard. VOA's Tibetan service reported last month the offer of cash rewards in China's Gannan prefecture, called Kanlho prefecture by Tibetans. Posters promised $8,000 to anyone who provides information "on the people who plan, incite to carry out, control and lure people to commit self-immolation."